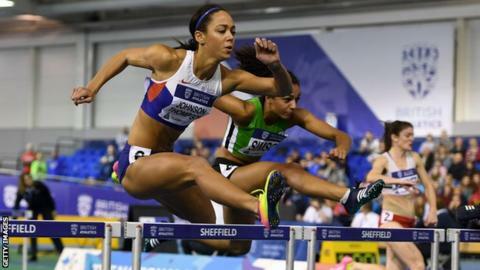 Katarina Johnson-Thompson has withdrawn from Saturday's Birmingham Indoor Grand Prix with a minor hamstring strain. The 24-year-old finished second in the long jump at the British indoor team trials on Sunday, to qualify for March's European Indoor Championships. It was her first competition since finishing sixth in the heptathlon at the Rio Olympics. The two-time Olympian, who was to compete in the long jump, is expected to be fit in time for the Europeans. "I'm truly gutted to not be able to compete," said Johnson-Thompson, who is the reigning European indoor pentathlon champion. "After a solid opening to my season last weekend, I was confident in producing an even better performance here so I am really disappointed that I won't have that chance." You can watch all the action from the Barclaycard Arena on BBC One from 13:15 GMT on Saturday 18 February.